Art Chrisman created many cars in his long career. 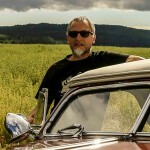 But not many people recognize him as a Custom Car builder. Lou Allens 1947 Buick shows he was actually really good at it. A couple of years ago, in 2012, Jeff Neppl was spending some time with Art Chrisman which had become a good friend of Jeff. 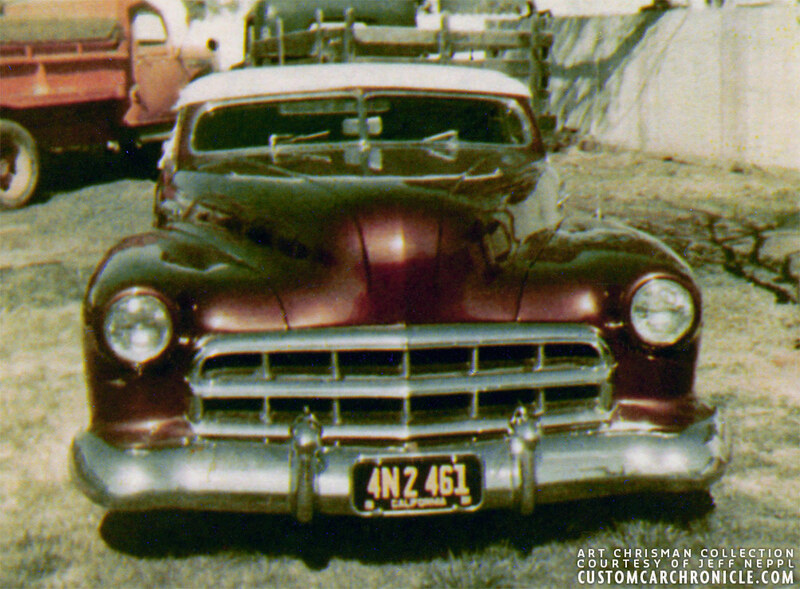 Art was always sharing his stories from the late 40’s and early ’50’s with Jeff, and told him how had done his fair share of Custom Restyling on customer cars during that period. Something not too many people know about it, and think mostly Race Cars when they hear the name Art Chrisman. 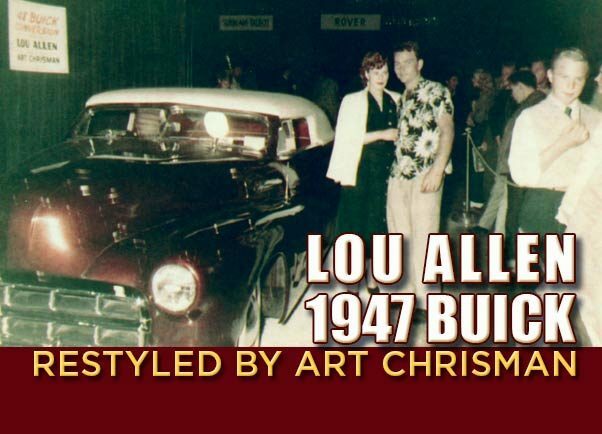 One of the cars he restyled was particularly nice, Art mentioned, it was an 1947 Buick he did for a guy named Lou Allen. That got Jeff very curious, so he asked Art to tell him more about that Buick. Art took out one one of his old photo albums and showed Jeff a couple of photos of the Buick he was talking about. And it sure was a beautiful Custom, just as Art had mentioned. 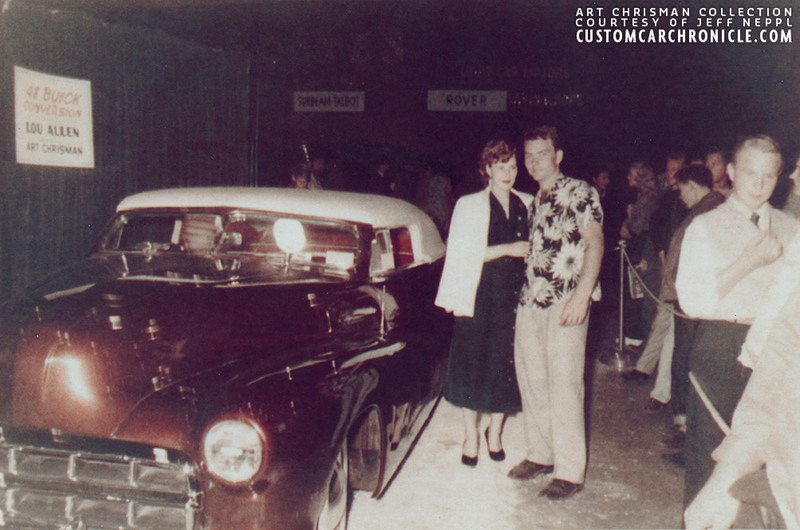 Art mentioned that the Buick was a huge hit at the 1951 Petersen Motorama show, and he took out two faded color photos taken at that 1951 show showing Lou Allen and his wife or girlfriend with the car. The fact that the Buick had been at the 1951 Motorama Show really got Jeff on the edge of his chair. At first Jeff thought he never had seen any photos of that Buick before, and thought it was kind of odd for such a beautiful car to have disappeared somewhere in the early 1950’s. It made him wonder about the car and the more he thought about it, the more he realized he had seen a Buick with so many similar details. After some time it dawned on Jeff…. it must be that Buick with the rather high stance in one of the Barris books. He looked up the Barris Technique books, and found the 1947 Buick in Volume #3. The car must have been later modified by the Barris Kustoms Shop for new owner George Sinamark. There is no doubt about it, the car that has been listed as the Barris Restyled George Sinamark Buick was actually restyled by Art Chrisman for original owner Lou Allen. Front view of Lou Allen’s Buick back in 1951. We don’t know were the photo was taken. When Jeff shared me the story Art had tole him, and showed me the photos and how it was show at the 1951 Motorama show, I remembered that Geoff Hacker had just shared a 1951 Motorama promotional movie on his Youtube channel and while watching that beautiful documentary earlier, I had spotted a Buick Custom towards the end of the movie. I looked at the movie another time, and sure there it was. The Lou Allen, Art Chrisman restyled 1947 Buick. The movie clip showed some more of the cars original details, which also helped confirm the identify it as the George Sinamark Buick. 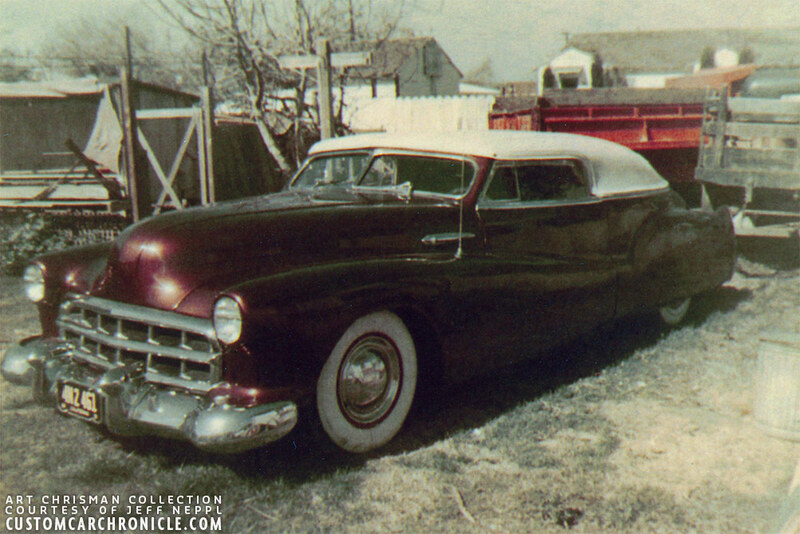 Cropped photo gives us a better look at the modified Cadillac grille, the molded splash pan, frenched headlights and modified hood. Notice how low that top is. 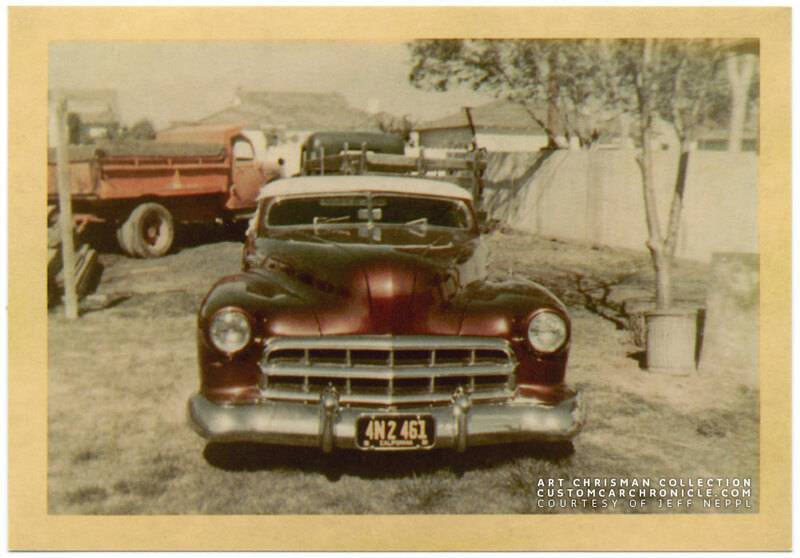 Art used a set of 1948 Cadillac rear fenders and rear bumper and grafted those to the Buick. 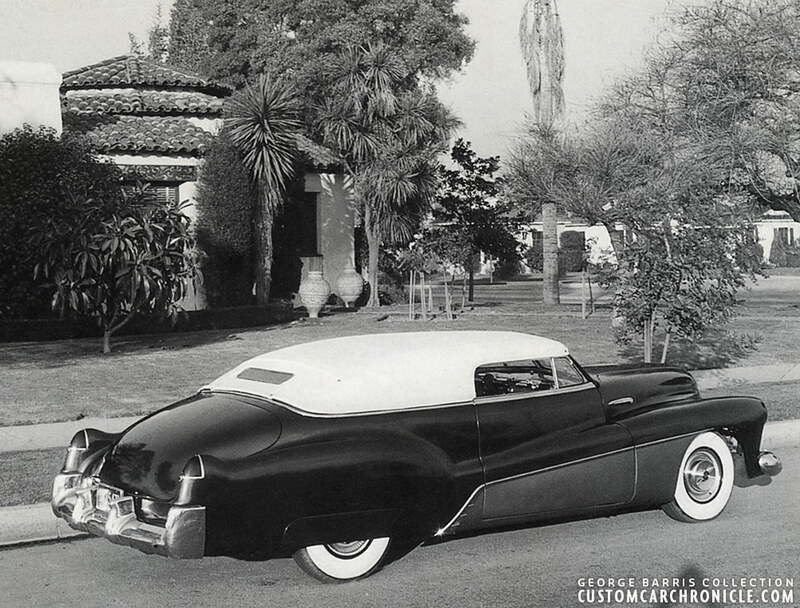 The rear fenders were molded into the body and the original Buick fade away fender panels, which are separate from the factory, were also molded to the body. Everything was leaded for that ultra slick, smooth look. At the front Art used the ’48 Cadillac front bumper, but the ’48 Cadillac grille did not look good enough on the Buick, so Art modified a 1949 Cadillac grille, which is wider and looked more modern, and installed that into the smoothed front of the car. He also frenched the headlights into extended front fenders, the 1948 Cadillac splash-pan was modified to fit the Buick body and molded to the front of the car. The Buick hood was welded solid, the center trim removed and anew mild peak added along the length of the hood from the center of the windshield all the way to the center peak of the Cadillac grille. The windshield post were chopped several inches. The padded top was most likely done by Bill Gaylord. The Barris write up mentioned that, and the looks of the top sure indicate that Bill created it. The top was styled in such a way that the rear quarter windows were part of the padded top, completely filled in, which made the car look very long and smooth, but must have created a huge blind spot, especially with the super small rear window. 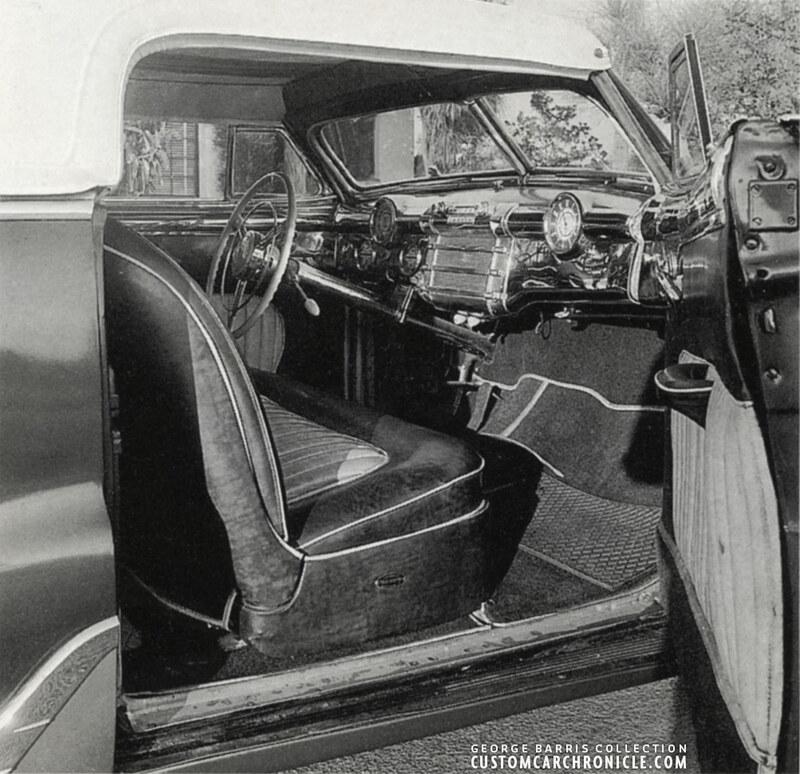 In the Motorama photos we can see that the upholstery on the interior was done in red and white. the interior was done by California Auto tops. The dash panel was chrome plated, as were the interior door tops, which gave the car a very luxurious feel. Beautiful front 3/4 view of the Art Chrisman build Lou Allen 1947 Buick. 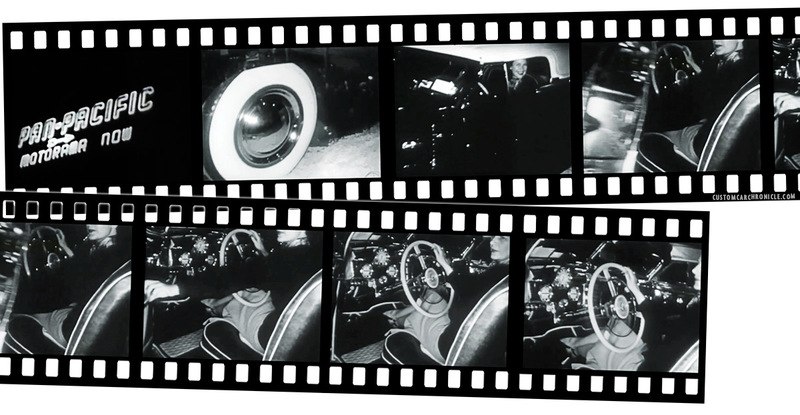 Movie stills from the Petersen 1951 Motorama promotional movie shows a few shots of Lou Allen’s ’47 Buick. Lou Allen and his girl with the Buick in the Pan Pacific Auditorium at the 1951 Petersen Motorama Show. Notice the white sand, or perhaps rock salt that was used to make the car look even better. 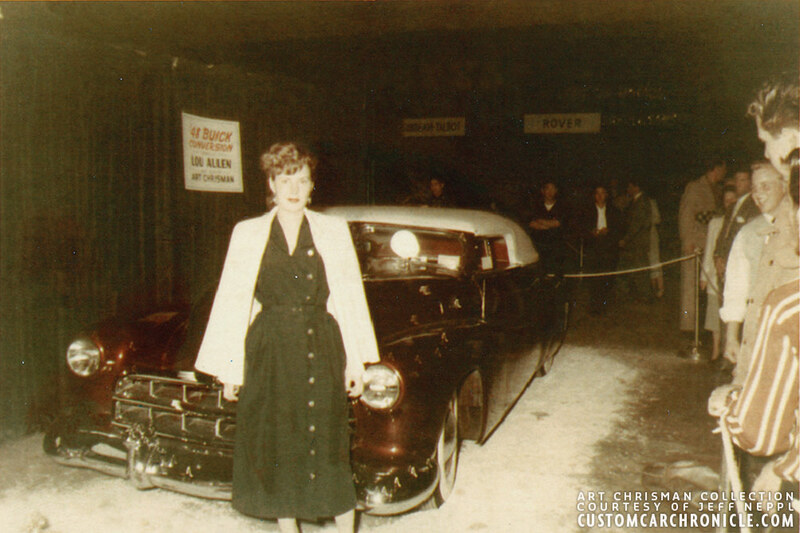 Lou’s girlfriend or wife posing with the Buick at the 1951 Motorama show. 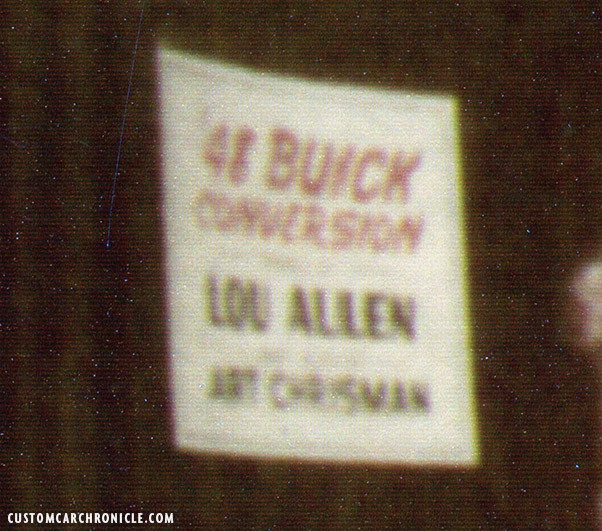 This is how the original color photos of Lou Allen’s ’47 Buick look. They were taken around 1951 and are badly faded and yellowed. that the The Buick was featured in George Barris’s book Kustom Car Techniques of the 1950’s Volume 3 as a Barris Custom. The owner of the car was George Sinamark, and the text explained how the car was built at the Barris Kustoms Shop. There was no mentioning of Art Chrisman, nor Lou Allen as being the original builder and the original owner of the car. 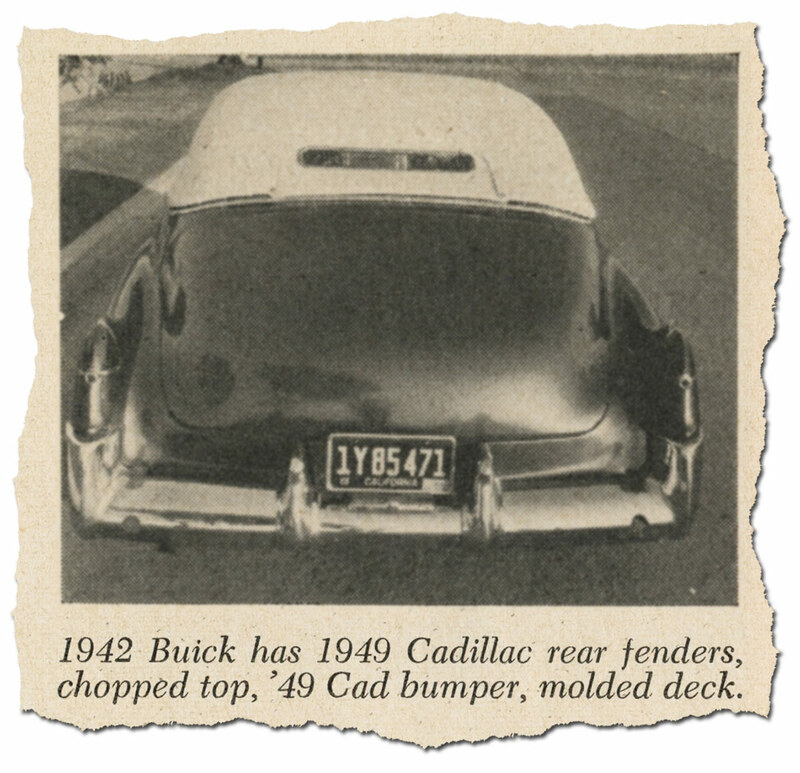 The two page feature wrongly mentioned that the car uses 1949 Cadillac rear fenders/taillights and rear bumpers. Those items actually came from an 1948 Cadillac. Only the grille incorporated by Art Chrisman comes from a 1949 Cadillac. The photos used in the Barris book are all taken by George Barris in front of his favorite location The House just a few blocks from the Barris Shop. The book mentioned that George Sinamark was from Pasadena California. We have asked around, but so far nobody has been able to tell us any more about George Sinamark, or the time this car was owned by him. Also unsure is if he bought it from Lou Allen directly, or if there have been other owners of the car between Lou and George Sinamark. 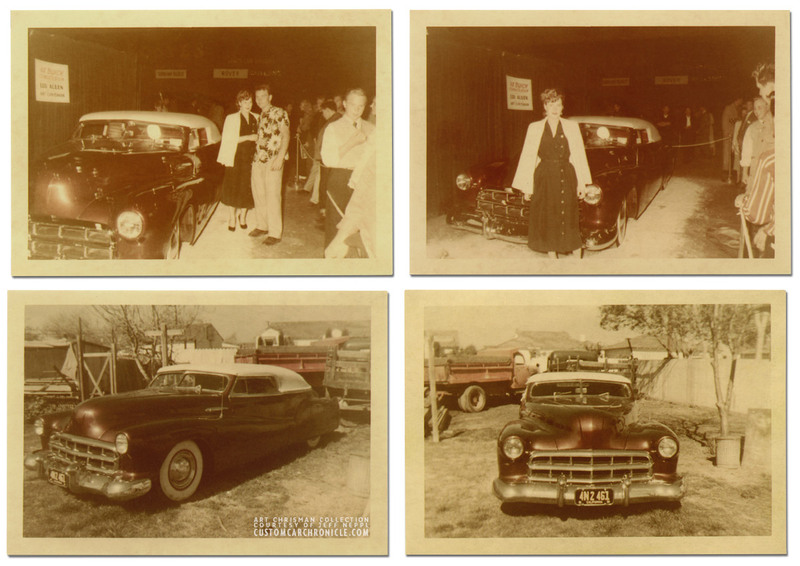 We do know that George was the owner of the car around 1955, when George Barris took the photos of the car in front of “The House”. Photos that have been uses in print for the first time (as far as we know) in the 1957 Custom Cars Annual., and later one small photo in the 1961 Custom Cars Annual. 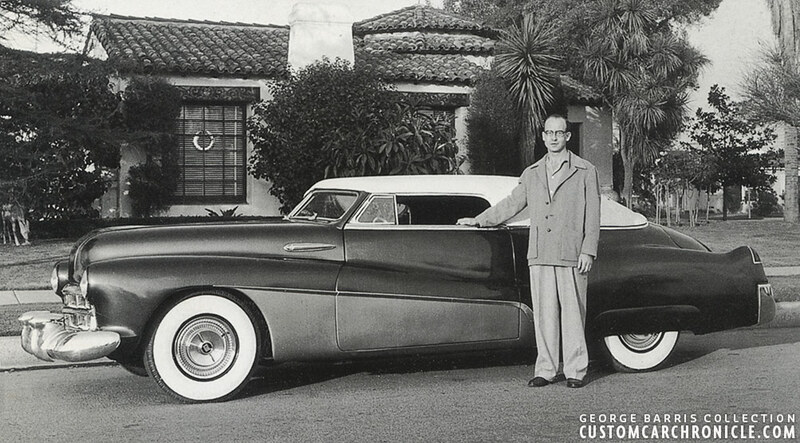 George Sinamark from Pasadena posing with his 1947 Buick freshly finished by the Barris Custom Shop. The photo session was at “The House” on Abbott Rd in Lynnwood, a few block from the Barris Shop. The rear quarter view shows the beautiful lines on the possibly Gaylord padded top. It also shows how nice the ’55 Pontiac side trim follows the ’47 Buick front fenders. It makes you wonder who came up with this combination. When the car was further modified at the Barris Shop there was not a whole lot done to it. The Barris Shop added a very unusual 1955 Pontiac side trim, flipped upside down and from side to side. The Pontiac trim followed the Buick fade away fenders really nice and was used to separate the Charcoal-light-metallic used on the main body, and the copper below the side trim. It also looks like the rear of the car was raised a little over the original lowering job done by Art Chrisman. Barris also added the 1955 Buick hubcaps to replace the single ripple smooth disk aftermarket hubcaps used on the original version of the car. Other than that the looks to be virtual the same as the original version. A good look at the California Auto Tops created interior done in red and white with white piping. The dash and door tops are chrome plated and so is the steering column. Side view photo of George’s Buick appeared in the 1957 Custom Cars Annual. Also from the ’57 Annual comes this low angle front 3/4 photo of the Buick. It shows that the car had an unusual slight forward rake at this time. One small photo of the George Sinmark version of the Buick appeared in the 1961 Custom Cars Annual. Sadly we cannot read the year tag on the License plate, but more than likely it was from 1955. In 1956 the California License plates changed to a yellow base plate, and 1954 had red year tags. The car was wrongly marked as a 1942 Buick. George Sinmark was born 15 Jan 1924 in Burlington, Colorado. His family moved to Los Angeles area at some point after 1942 when he registered for the draft. He passed away in Sacramento in 2008. And we have no idea what happened to the Buick. 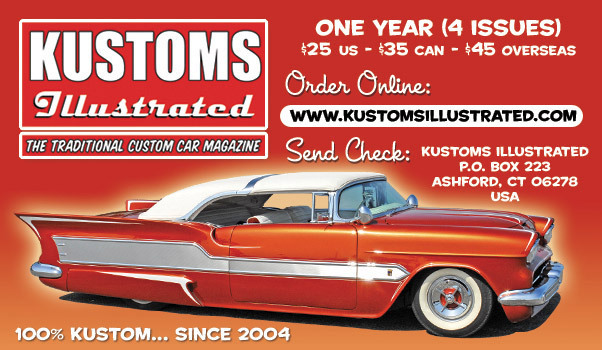 Special thanks to Luke Karosi from Kustoms Illustrated Magazine for scanning the Art Chrisman photo.